The Romanian President, Traian Basescu, has received an official reprimand for a discriminatory remark he made about a Romanian TV journalist. The Council against Discrimination said that his "stinking Gypsy" remark was "degrading" and it gave him a warning. 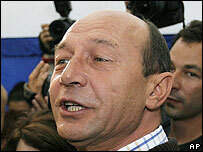 Mr Basescu's words were recorded on a mobile phone he had snatched from a female TV journalist. He later returned the phone, but the contents were broadcast on TV, triggering a complaint to the council. The incident took place on Saturday, the same day Romanians voted by a three to one majority against impeaching Mr Basescu, in a national referendum. His words caused widespread offence, not only among the Roma (Gypsy) community in Romania. Mr Basescu later apologised. At the time the president was shopping with his wife. He was followed by Andreea Pana, a reporter with the private TV channel Antena 1, in which one of the president's political foes, Dan Voiculescu, has a financial interest. He lost his temper and grabbed the reporter's phone, used for recording him. The phone was returned, but Antena 1 broadcast the contents. They included comments by Mr Basescu to his wife, in which he called the reporter "a stinking Gypsy". The Romanian Press Club, the self-regulatory body for journalists, has strongly condemned Mr Basescu's actions and filed a complaint with the prosecutor.